Lifou, New Caledonia. March, 2014. “Help, I need somebody, Help, not just anybody.” They are great lyrics from the well-known Beatles song, Help. They became a reality for me last week. The picture above was taken after conquering a hike through thick rainforest to swim in a freshwater cave. I was glad I had taken my walking stick, but even happier that my two son-in-laws and nephew were there to help me on this adventure. I realised I would not have been able to traverse down or up the steep inclines without their help. Without them I would have missed so much and never would have experienced swimming in an underground cave, taking a leap of faith and jumping into the black swimming hole. With my legs and arms weakening from the effects of Motor Neurone Disease (read more via the “About MND/ALS” tab at www.fridayswithphil.com), I have come to rely more and more upon the help of others. This experience has highlighted that all of us need the help and togetherness of others to achieve things we could never achieve on our own. As a leader of a Church, pre-MND days, I had no hesitation in asking for help and working together with others to achieve goals and vision that were for the benefit of others. However, asking for help for myself was, and is, a different matter. I have always found it easier to give than to receive. How about you? I have realised that not being able to receive help is not only a bad character trait but is also indicative of a very limiting and dangerous attitude: pride. Living a life trying to cope all on your own, “She’ll be right mate”, or “I’m OK”, suggests that I don’t need your help or anyone’s help. I have come to realise, I do and we all do. None of us can achieve anything big, courageous or challenging without the help of others. Confident and courageous people need help and need the togetherness of others to experience life to the max. One thing I noticed, when those three strong young men took a slower trip down and a very slow trip back up from the cave, is that even though I was a physical burden to them, they found pleasure in helping me achieve what I could never have achieved on my own. In other words, not only do people want to help you, but they are also encouraged by the process of helping. All the way up the track, I had to pull myself up by holding onto a strap secured to a Shannon’s back while Kaiden pushed me up from behind (literally pushing on my behind). This left Josh carrying two heavy bags up the incline. All the while I had a cheer squad in Glenda, Rachel, Chloe, Belinda, Rebecca and Jessica encouraging me on. I could have said, “Don’t bother with me, I will just wait here at the top until you return.” However, I would never have the memory and all those who helped would never have had the joy of helping someone do something they could never have done on their own. The Bible says, in Ecclesiastes 4:12, “By yourself you’re unprotected. With a friend you can face the worst. Can you round up a third? A three-stranded rope isn’t easily snapped.” Maybe today you could lend a helping hand, or maybe you could ask for one. Wow! That was a wonderful experience for all of you, cheers to all! Thanks so much Hazel for your prayers. How good is it when at 87 your neighbour was still looking to give themselves! 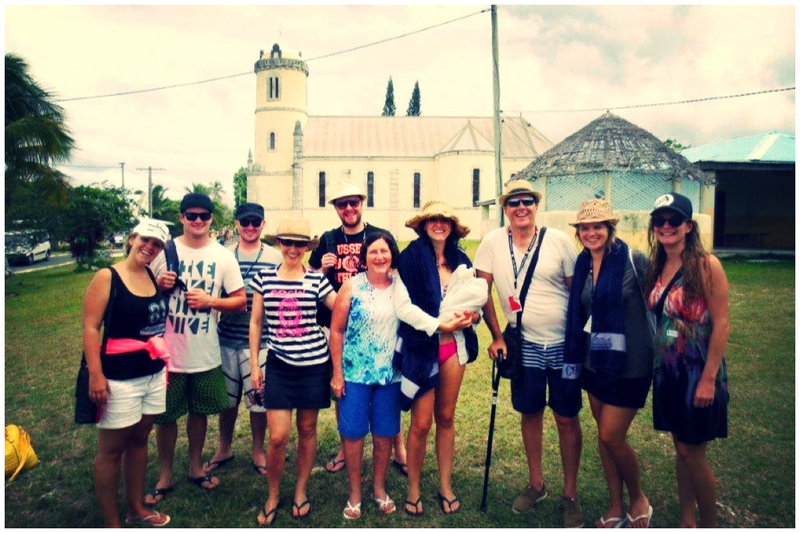 Hi Phil – we were in Lifou in October, never been to that part of the world before, but not nearly as adventurous as you! We were cruising with my elderly parents and sister. I think it brings us closer together when we work together as you described to achieve something. Thats true Alex. Sounds like a similar cruise and you would of made some great memories. This is such a great encouragement Phil. I love the insight you allow us to have through your written illustrations. It has provided me with revelation upon revelation! Thank you for allowing your life to be an instrument of illumination to others! Thanks Clare, not just for the reply but your help in times gone past, much appreciated! Love your blog Ps Phil.. todsy as I was reading it made me think of who I have asked for help. I thank the Lord because He has always been faithful and those who have helped me I have the fondest memories. Today I am thankful for time to remember that those who have helped I can call them friends. Hi Lynda, yes good to reflect on the goodness of others and also how we can make so much difference to each other. Great bog as usual Phil. Yes, we all can do with learning to accept help from others at times. Thanks Mick. Great seeing you the other day mate, looking good. Hi John and Patricia. Very fond memories for me as well. Thanks for the word and prayers. Love you guys and hope to see you soon. We really do all need each other to lean on. No never alone, no never alone comes to mind. Jesus with flesh on. Are our prayer partners, and the lifters of our heads. Thank you for reminding me to be thankful. Love you. Thanks Wendy, think of you often and your family in USA. Love you.